You are here: Home / Learning Centre / What Are the Thinking Process Tools? 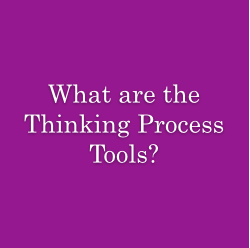 What Are the Thinking Process Tools? What Are the Thinking Processes? The Thinking Processes (TP) of TOC first appeared in the novel It’s Not Luck (1994), although a preliminary sketch of the Conflict Cloud had been published in the essay “What is this thing called TOC” that Dr. Goldratt wrote in 1991. Since then dozens of books and publications have become available, each of which claiming to provide further insight into the way the TP should be used. Oded Cohen and myself dedicated nearly 40 pages of our book Deming and Goldratt: the Decalogue (1999) to that end. 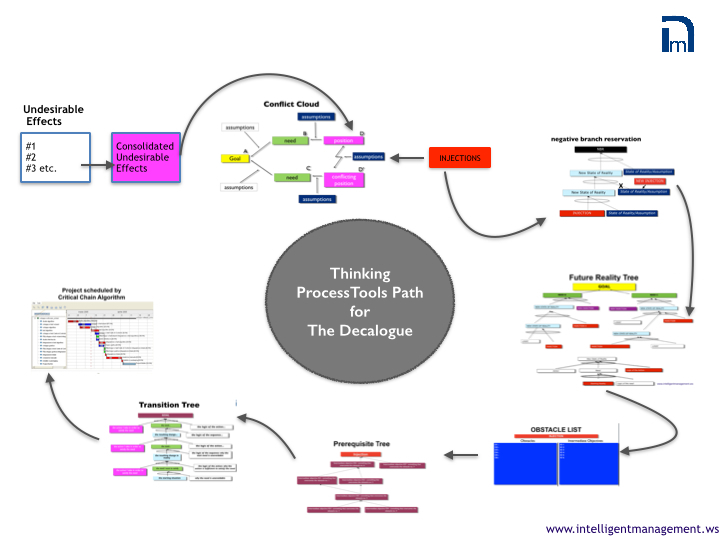 Indeed, the TP are foundational for a successful adoption of our ten step process called “The Decalogue”. is supported and facilitated by a purposefully designed logical tool. All together the TP provide a very comprehensive and powerful mechanism that can ensure effective supervision and guidance over the change process. The TP also represent an ideal companion to the development of a project plan. The TP help the visualization (through precise verbalization) of the complex, highly nonlinear network of cause-effect relationships that mark reality, as we perceive it. Such a network maps the “conversations” that make up our cognitive horizon. With “conversations” we mean the aggregate of some of the most relevant categories of speech we use and that define the semantic boundary of our universe. Within the framework of Intelligent Management the TP play a very critical role; they enhance and fortify the faculties of the intellect that are responsible for the conception of new ideas (intuition), their full development through analysis (understanding) and the operational deployment of the actions needed to carry out the implementation of the fully analyzed idea (knowledge). The TP do so by linking these faculties, hence enabling a higher level of control over the interdependencies among these faculties; the TP act as controller over the variation associated with our thought processes. Moreover, the TP help to harness the powerful forces represented by the emotions involved in the change process. Emotional attributes play a role in the change process that is just as important as the purely intellect driven one. The reason can be easily understood. If we seek to activate in an organization a process of continuous improvement we must trigger in people the desire to continuously learn. Such a desire cannot be sustained over time purely by the rational realization that “to live is to learn”. It just does not work that way. Moreover, learning can be very de-stabilizing on an emotional level because it continuously pushes forward the boundary of our cognition and, with it, the gap between what we know and what we feel we can do with what we know. In order to leverage in a positive way the tension originated by this gap we must get a handle on our emotions, understand them and refine them; in other words, we must transform their potentially destructive power into a positive force that sustains change. This is precisely the role of the TP: to help us manage the blend of intellect and emotion in the change process. In this way, “change” loses the somewhat ill defined feature of a corporate exercise and becomes that transformational effort which is at the very heart of the success of every individual and organization alike.